Made by David Drake (Dave the Potter), American, 1800 - c. 1870. Made at the Lewis J. Miles Pottery (Miles Mill), Edgefield district, South Carolina, c. 1830 - 1879. Dave, an enslaved African American, worked at the Lewis J. Miles Pottery in South Carolina. After emancipation, he adopted the surname of Drake. His exceptional skill as a potter is demonstrated by his ability to create unusually large storage vessels such as the one seen here. He often adorned his utilitarian forms with inscriptions that refer to the Bible. While most slaves in the American South served as agricultural field hands, many others were skilled in crafts related to the rural economy such as pottery-making. The majority of enslaved potters were individuals working in white-owned shops, although in certain areas, such as the Edgefield District of South Carolina, they worked in groups. 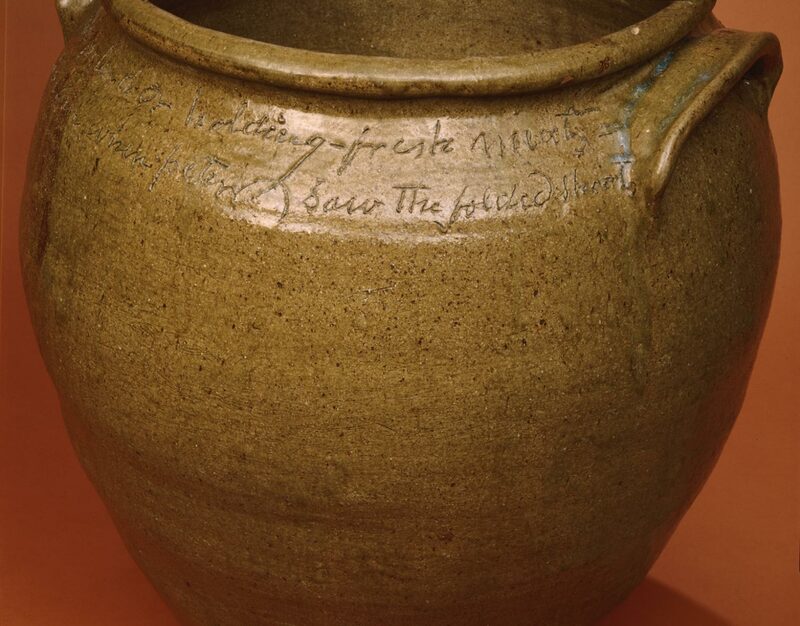 The black potters of Edgefield were distinguished for their production of large stoneware jars that served mainly as storage containers for staples such as lard and salted meat on farms and plantations. 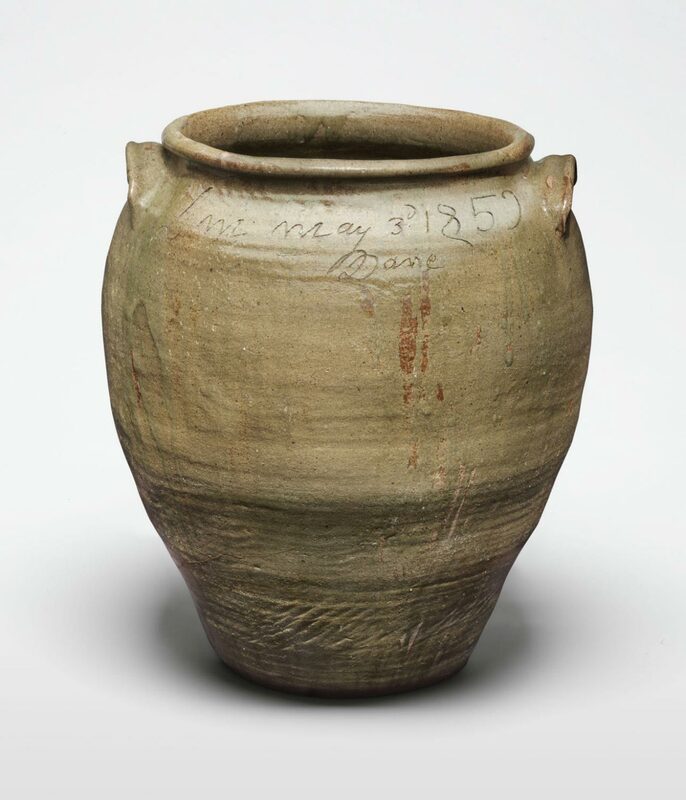 A spectacular example of the wares of the Edgefield potters, this large storage jar was made in 1859 by Dave, an enslaved African American who adopted the surname Drake once emancipated and became the most accomplished African American potter of the nineteenth century. His work, which spans over forty years and represents the best in the Edgefield tradition, is typically bulbous in form, widest at the top with a thick, rolled rim and high, broad shoulders. His jars were primarily very large food storage containers that he made in turned sections, one layered on top of the other. 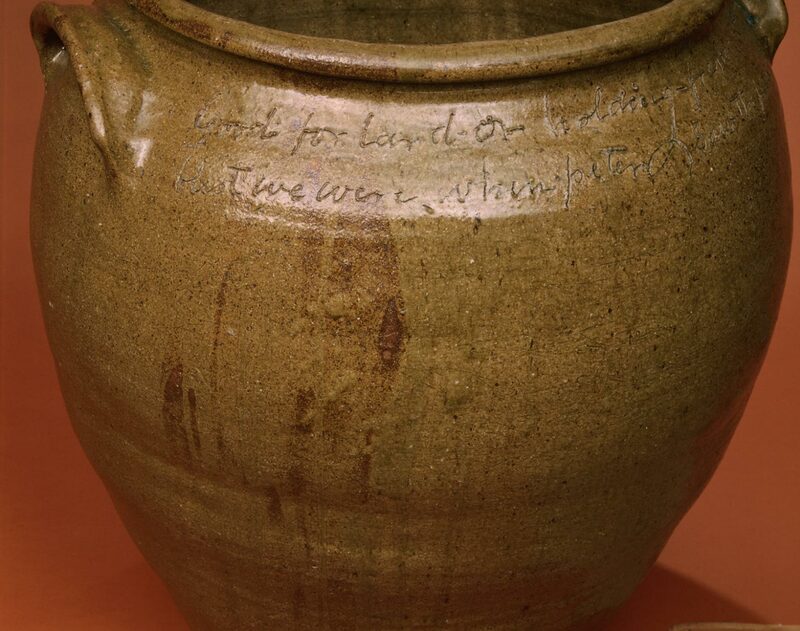 This example, one of the largest known, is inscribed “Good for Lard or Holding fresh Meat.” Dave often incised his works with rhymed couplets, which sometimes refer to the function or reflect his comments on life and religion. Here he wrote, “Blest we were when Peter saw the folded sheet,” possibly a reference to an edict allowing early Christians to eat pork. Dave also included the initials of his owner— “LM” for Lewis Miles; the date of its manufacture— “May 3d, 1859”; and his name. As a fine example of African American craftsmanship, this jar is an important addition to the Museum’s holdings. Martha C. Halpern, from Philadelphia Museum of Art: Gifts in Honor of the 125th Anniversary (2002), p. 55.